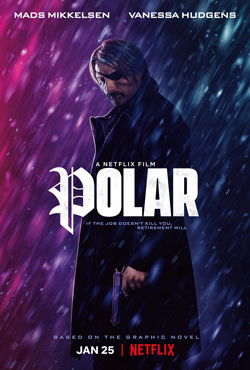 Based on the graphic novel of the same name, Polar (2019) is almost like a John Wick story, but with an older version of the character. Mads Mikkelsen plays the protagonist, Duncan Visla in this film, who is an assassin known as "The Black Kaiser". Visla is fourteen days from retiring as a high-level assassin who works for a corporation known as Damocles. Their retirement plan allows those that work for them to match their pension contributions, allowing to retire with a lot of money. The catch is, Damocles kills their retirees so that they do not have to pay them, which is the main plot of the film. The action is decent and some, or maybe a lot of it is over the top but what do you expect from a film based on a graphic novel? Some critics are attacking the film for that reason but there are some great visuals too that are worth watching. Netflix films can give you a break from binge-watching something and this film is a nice escape from that. If you are looking for something that is entertaining, has a start and end time this is something worth watching. Polar(2019) was released for the weekend on January 25 and makes for some good movie filler this winter.